X-rays and other imaging are one of the big four in diagnosing shoulder and elbow problems (the four being- Hx, SST, PE, and X-ray/films). All patients need to have a current x-ray for evaluation purposes. Patients with MRIs only, outside films and out dated x-rays taken here (more than 6 months) - need new films done by our techs. All new patients must have an x-ray. MAs and Nursing Staff - Please have all females remove their bras and put on a gown prior to calling x-ray to get the patient. Bras often have metal in them that show up in the shoulder field and cause delays as patients must be refilmed. Residents, students and staff on the Shoulder and Elbow Service need to have a PACs account and be familiar with using Centricity. "shoulder keeps coming out of joint"
Most patients need a three view arthritis series (Axillary, Grashey, and Template of Shoulder). If patients are complaining about instability, you can order an instability series. This can be confusing since many patients are not sure how to describe their shoulder symptoms and often say they are unstable due to arthritis or pain. Unless it is clear that they are unstable or had a dislocation, go ahead and order an arthritis series. Indication: Instability, Bankart lesion, Hx of dislocation, "shoulder keeps coming out of joint"
This is for AC separations. If a patient has pain or instability in sternum area they need an Serendipity View of the SC joint. You may also need to do an AC series to assess the Clavicle. When in doubt - order an arthritis series. Done properly, this view should line up the glenoid so that it is perpendicular with the plane of the xray. This allows for better evaluation of gleneral-humeral joint space, and position of the humeral head in relation to the glenoid. With the humerus adducted, you can better assess if there may be humeral bone contacting the inferior glenoid - what is often referred to as "Poo Corner." The UW Radiology site has an excellent example of this view. Done properly, this view allows of assessment of humeral wear in the anterior and posterior planes. And if aligned just right, it should show bone defects in the anterior glenoid lip. This view is actually difficult to get just right, even by a skilled radiology tech. 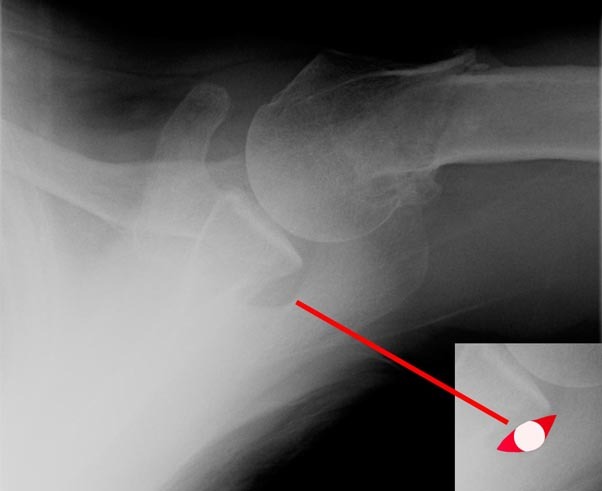 A true axillary view will have an "eye" just posterior to the glenoid (see image above). If this eye is not present, the anterior glenoid edge will be obliqued by the superior or inferior glenoid edge - which may mask severe defects that only a properly aligned axillary view will reveal. If the "eye" is not seen on the axillary view, this shot should be redone. This view may also show decreased joint space, fractures, osteophytes, dislocations, Hill Sachs and reverse Hill Sachs Lesions. The patient is supine on the table with the cassette placed under the shoulder. The palm of the hand of the affected shoulder is placed on top of the head, with the fingers directed toward the back of the head. The elbow of the affected shoulder should point straight upward. The x-ray beam tilts 10° toward the head, centered over the coracoid process (see se above). The goal of this view it to catch a humeral head defect in patients with a history of recurring anterior dislocation of the shoulder. In this technique the patient sits with the scapula flat against the cassette (as for the AP view in the plane of the scapula). The x-ray beam is centered on the coracoid and directed perpendicular to the cassette (45° to the coronal plane) except that it is angled 45° caudally. The beam passes tangential to the articular surface of the glenohumeral joint and the posterolateral aspect of the humeral head. This view is likely to reveal both anterior glenoid lip defects and posterior lateral impression fractures of the humeral head.